So you've planned your trip to France and you've booked those plane tickets! You've also brushed up on your high school French, taken French lessons, listened to French podcasts in the car and read over your French survival guide phrase book with your best over the top, theatrical, exaggerated Paree accent (picturing yourself with a beret, stripey blue and white top and baguette in hand of course ;). You arrive bright-eyed and bushy-tailed in Paris and are ready to show off all of your hard work and connaissance. It is now officially your time to shine. You open your mouth fairly confidently to ask a well-practised question, it goes smoothly enough until your inner deer-in-the-headlights decides he/she needs to take over. You were great at the question, but now you have absolutely no idea what the response means. Your eyes begin to dart from side to side awkwardly. Umm help..? Or, you manage to answer a question in passable French and are pretty chuffed with your effort, only for the Frenchie to switch to English after hearing your accent. Appreciate the gesture and all but ouch. Obviously your French wasn't good enough to continue. And how about when you manage to exchange a few sentences, everything is going well, until you are thrown off by one word, one response, one question, one look, one change in body language. Uh oh, that damn deer is coming back. I'm a self-confessed geek. I used to work 12 hour shifts as a pharmacist from 9am to 9pm, come home, eat dinner then study French on my own until 3am in the morning. I tried every single possible French learning strategy and approach in the book to cram in as much as possible in preparation for my move to Paris. At one point in time I had 4 tutors on the go! Yet even with all this intense studying, upon arrival in Paris I still found myself in those exact awkward confusing situations I was hoping to avoid. e) those ever so precious 'light bulb' moments (Ohhhhh! I get it now...!) that somehow ridiculously makes everything worth it. 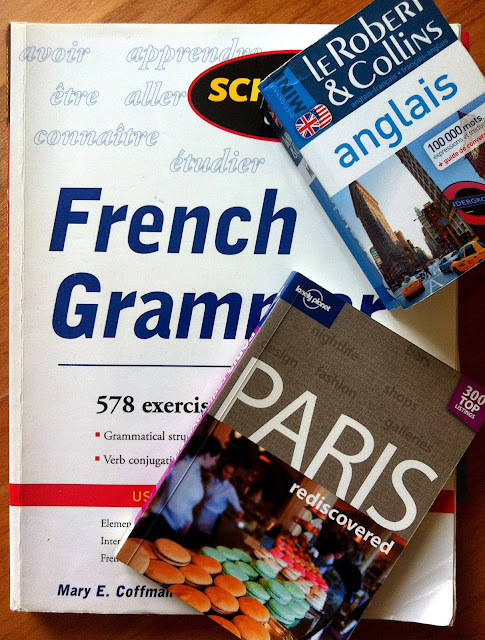 Of course, if you are only in Paris for a short period of time during your travels, you might not have the luxury of time to gradually refine your language skills. So here are 15 of the most important cultural/language tips I had learnt during the first six months of my move. Little details of day to day Parisian/French etiquette, customs, traditions, vocabulary, phrases that I hope you will find useful during your stay in Paris, no matter how brief the duration! It is customary to say "bonjour" or "bonsoir" when you enter a shop as a sign of acknowledgement to the owner of the shop. You'll find most of the time the shopkeeper/staff will beat you to it, bonjour-ing/bonsoir-ing you before you even know it. As a general rule obviously, bonjour during the day and bonsoir in the evening. Sometimes you might get a bonsoir to your bonjour or vice versa, even as early as 4-5pm. Don't worry about it, it can get annoying as you start to wonder if they are replying with the opposite on purpose but apparently it's a widespread annoyance among Frenchies as well as non-Frenchies. Double points if you add bonjour/bonsoir Monsieur or bonjour/bonsoir Madame to be specific. You will notice the difference in service with these two extra words! PS The longer you stay in France, the more you'll notice that this bonjour/bonsoir tradition extends much further than just in the shops, you'll find people bonjour/bonsoir you everywhere, in the elevator, outside your apartment block, at the market, at the bank, at the bakery etc. The French highly value acknowledging others and being acknowledged. It may feel weird at the start initiating communication with a stranger (or receiving it for that matter) but after a while it feels nice for your existence to be acknowledged. Plus there's no pressure to engage in further chit chat, a simple bonjour/bonsoir is all that's required. When stopping someone to ask a question or stopping a sales assistant, don't rush into "excusez-moi" straight away. It feels natural to start with "excuse me" in English but in French it's considered too rushed and perhaps impolite. Even if you start the interaction with "excusez-moi" you will find people will respond with "bonjour/bonsoir". So you've mastered the bonjour/bonsoir, then the excusez-moi bit. How do you ask if they have something in store? When leaving a shop even if you don't buy anything, you should say "merci au revoir" to be polite. When you forget (like I often do) you'll usually be stopped on the way out with a "au revoir, bonne journée" even when you don't say anything. To which you can awkwardly respond.. When ordering something take away (baguette, crêpe, croissant etc) it is sufficient to say "un/une...... s'il vous plaît" (un/oone...... sill vooh play). It sounds weird at the start but you'll find it isn't at all rude to say 'one croissant please'. The same goes for asking for the bill "l'addition s'il vous plaît" (ladd-issi-on sill vooh play) is fine even though you'll feel weird saying 'the bill please' like a member of royalty summoning the bill. "Est-ce qu'on peut prendre l'addition s'il vous plait" (esk-uh on purh prond ladd-issi-on sill vooh play) which translates to 'are we able to take the bill please'. This is the equivalent of "can we grab the bill please". Don't forget to add "s'il vous plaît" at the end. And, "merci monsieur/merci madame" when you hand them back the menu, when you receive your food, when they take away your plates. If you bump into someone you can use "excusez-moi" literally meaning 'please excuse me'. When you are introduced to someone, chances are they will lean in and do the kiss kiss thing. Don't be shocked. It's normal for Parisians to do two kisses (other regions might go in for a third or even, a fourth!). It is also completely normal for men to kiss kiss other men. Go with the flow if you're comfortable and air kiss twice. If you're not comfortable, quickly stick out your hand to turn it the incoming kiss kiss into a handshake before they go in for some cheek to cheek action. Follow on with "enchanté" (onshontay) which means that you are 'enchanted' (to meet them..!). You'll have to do the same for good byes, it takes forever to say good bye to everyone. Trust me. "Ciao" (chao like in Italian) meaning, well, ciao! 15. DO YOU SPEAK ENGLISH?? But like any travels anywhere, demonstrating an effort to speak the local language before resorting to English will be very much appreciated and will take you a long way! Parisians aren't as rude as they are stereotyped to be, they just speak what they think and are less likely to do "fake" to keep anyone happy (even the customer, gasp!). Make an effort with the language, try to be aware of what is considered to be polite and impolite in their cultural context and things will flow smoothly, I assure you. Wow, thank you so much for sharing it on twitter! I'm so happy that you find it useful! Très bien Lesson=) Nhan! Hopefully I could learn these 15 magic tips by heart before my next trip to visit Paris. Bonne journee GREAT WRITER NHAN! This is a great blog! Very useful information. I'm hoping to come to Paris next year. Thank you! Thanks and more thanks for this wonderful article. I speak about 5 words in french but want to be culturally aware to be both curteous and respectful of their culture. I live in San Francisco and this stuff wouldn't work here. The women would be calling the police!! I'm so glad you found this helpful..! It's taken me a long time to understand the intricacies of the French culture and I remember so clearly the my first six months of 'teething' and settling into Paris. Sometimes it's helpful to have a little help switching on your "when in Rome" mode..!